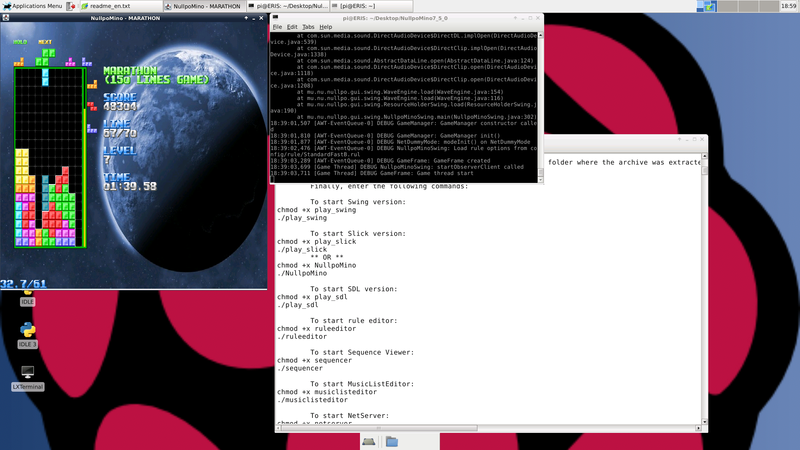 Out of curiosity, I attempted to run NullpoMino on Raspbian 28/10/2012 with a Raspberry Pi Model B 512 MB. The Swing build ran after installing the default-jre package using apt-get; as expected, the SDL and Slick builds did not start at all due to lack of ARM support in the respective libraries. Using the “high” overclock preset, 96 MB of GPU memory, and LXDE replaced with XFCE4, I got a framerate of no more than 10 FPS despite what the screenshot suggests, the piece spawn sounds did not play, and the game appeared to slow down as lines cleared. These issues aside, the game was playable. I would personally like to see a TGM derivative built natively for ARM and the Raspberry Pi in particular, but such a project would have to be an entirely new endeavor.